The E116C bi-colour LED on camera pad light delivers a softer output than traditional on camera units. The light is suitable for portrait lighting or a single person interview; it is also ideal for product shots. 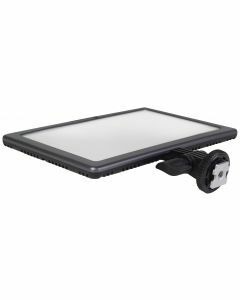 Thin and lightweight, it's a great item to include in any kit bag, whether you need a general purpose, dimmable on camera light or a small fill light.